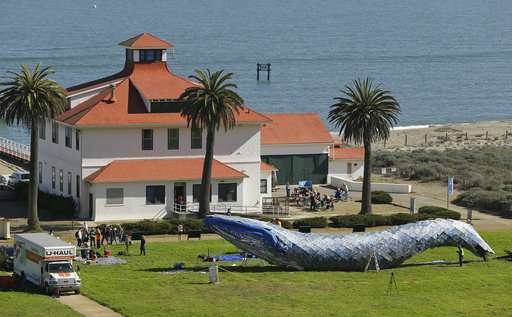 Artists are putting the finishing touches on an 82-foot-long (24-meter-long) blue whale made from discarded plastic that will be on display near San Francisco's Golden Gate Bridge to raise awareness about ocean pollution. The Monterey Bay Aquarium said Friday a blue whale can weigh 300,000 pounds (136,000 kilograms)—about the amount of plastic scientists say enters the ocean every nine minutes. A 2015 study by Jenna Jambeck, an environmental engineer at the University of Georgia, found 9 million tons (8 million metric tons) of plastic waste enter the ocean annually. 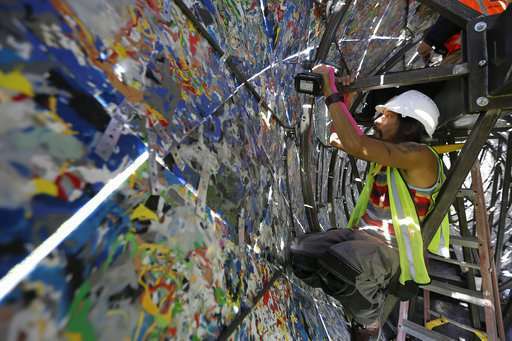 The sculpture created from plastic water bottles, lids and bags by artists Joel Deal Stockdill and Yustina Salnikova will be publicly unveiled Saturday. It is located in Crissy Field, the heart of the Golden Gate National Recreation Area. It is sponsored by the aquarium in partnership with the National Park Service and the Golden Gate National Parks Conservancy.